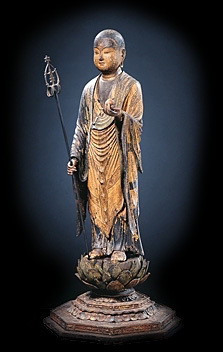 In the spring of 1998, the Asia Society offered a rare opportunity to view Japanese art of the highest quality from the Mr. and Mrs. John D. Rockefeller 3rd Collection. Here we present a virtual exhibition of more than 25 objects in the collection. Visitors can select either an interactive QuickTime tour or a more linear progression through the exhibition. For the exhibition the Asia Society also asked the scholars Sylvan Barnet and William Burto to update their authoritative bibliography of Japanese Art, A Reader's Guide to the Arts of Japan, for our website. More Than Meets The Eye: Japanese Art in the Asia Society Collection was curated by Teresa Lai, a former Museum Intern in Asian Art at the Society, and a doctoral candidate in Japanese art history at Columbia University. The QuickTime Virtual Tour of the exhibition was created by Christian Ditlev Bruun. Support for the Asia Society's Cultural Programs is provided by the Friends of Asian Arts, The Starr Foundation, The Armand G. Erpf Fund, and the Arthur Ross Foundation.